I spent two enjoyable and information filled days at the FoxWoods Casino attending the WPT BootCamp for Cash Game Players. There were 40+ attendees with almost 20% of the audience being female. Our instructors were: Lee Childs, Rick Fuller, Nick Brancato, and Eric ‘Rizen’ Lynch. Rebecca Joy, Event Coordinator at WPT Boot Camp, was the person behind the scenes that help to make things happen. Thank you, Rebecca. The training took us from Pre-Flop play right down to river play. The format was lecture, questions and answers, and then labs for each topic. We were all giving a chance to play several hands of No Limit Holdem poker and then explain why we took the actions we did. Being able to discuss my game was great and the pros told it like it was. I took back some great ideas and concepts that I will work into my game. Have you ever had a chance to talk with the pros about your game? What would you most important question be? Do you feel it would help? I have just completed a book about tournament poker that has turned my thinking upside down about how I should play. 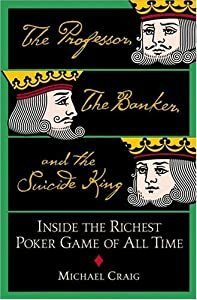 The book, The Poker Tournament Formula by Arnold Snyder, stated that the type of tourneys with levels increasing in 5, 10, 15, 20 or 30 minute increments are considered to be “fast tournaments” by his definition. Snyder states that fast tourneys require more luck than skill due to the fact that the blinds and antes increase quickly to the point that all players, except perhaps the chip leader at the final table, will be short stacked. 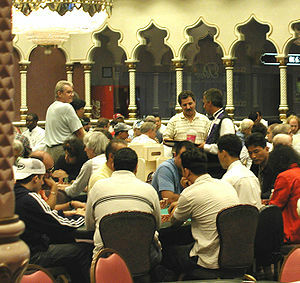 In order to survive a fast tourney, Snyder says that you must play aggressively at the start of the tourney while the value of the blinds and antes are low in order to accumulate chips quickly. He does suggest that stealing the blinds and taking shots at winning pots are one way to amass the chips that you will need at the end of a tournament. The style of play that he suggests for a fast tourney is not one that I am used to playing. In fact, I usually tend to be a little more careful when I play. When I tried to use some of the ideas and methods that he suggested, I ended up busting out of the tourneys rather quickly. Perhaps I need more practice? He does state that the style of play needed to win will actually see you busting out early but states that this is better than surviving only to make it to the final table without enough chips to win. Winning back your buy-in should not be your goal – winning first place is the goal. 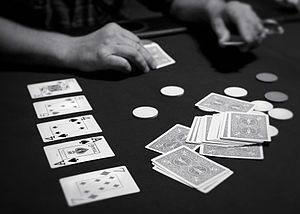 You cannot just wait for good cards as they do not come around often enough in a fast tourney. However, if you have large starting stacks of double or triple the normal 1,000 – 1,500 you can be a little more selective about taking shots and risks. 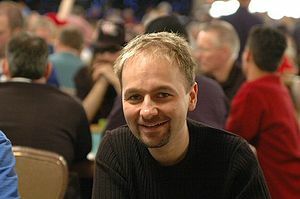 The skills that he teaches in this book, he says are also useful in slow tournaments such as the WPT five day events. All tourneys at some point towards the end become a fast tournament. If you have the skills necessary to win a fast tourney you should do fine at the slow ones. The more skills that you have, the better off you will be. Do you play in both fast and slow tourneys? How does your style vary from each type? How do you go about accumulating chips?